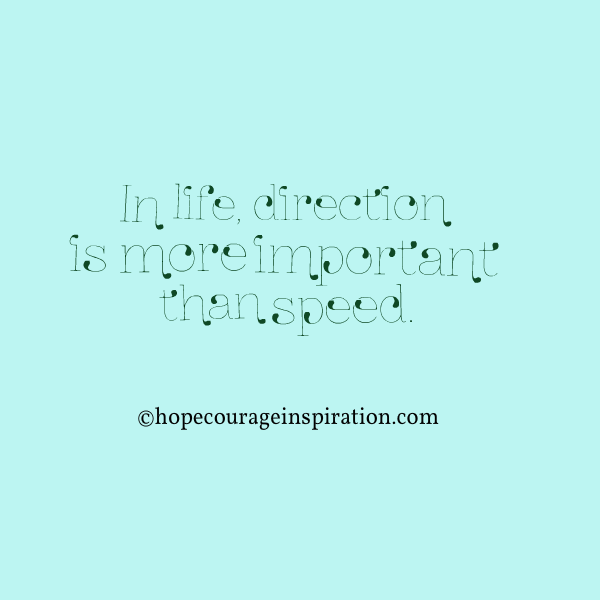 When it comes to life, direction is more important than speed. If you begin with the expectation that nothing meaningful will occur today, you won’t be disappointed. Mindset is a choice offered up every moment of every day, and it’s a particularly important starting place. Consciously choose your direction each day; this is your ship to sail. Recognize when your sails need adjustment and when your course has strayed. Only *you* have the power to right the ship. Winds will shake us and rain will soak us, but storms will never deter us. This life is ours to live and ours to choose. Let’s choose our direction wisely and purposefully. Set small, attainable goals and work consistently and persistently to achieve them. Recognize opportunities and seize them. Strive to be the best you can be and know *that* is success. You are the captain of your ship, no matter the circumstances that surround you; you have both the strength and the ability to direct your path. Adjust your sails and enjoy the journey.